Want to have fun while giving back to nature? Then join us at the Irvine Ranch Conservancy’s one-of-a-kind Native Seed Farm in Irvine! You will help us plant new little plants into our growing fields and use various weeding tools to remove weeds so our new plants can grow up strong. Having more plants at the Farm means more seeds to harvest and use to restore wildland in Orange County. Absolutely no experience required, and all equipment is provided! Please note our Minors Policy as shown on the letsgooutside.org website: All minors (under 18 years of age) must be accompanied by their parent or legal guardian. They must also (both parent and minor) be registered for the Irvine Ranch Conservancy led program they wish to attend. Reviewing the 1-5 Difficulty Ratings will help you evaluate your readiness to participate in this Level 1 activity. Participants are required to come prepared by reviewing the Stewardship Tips in their confirmation email. Under-prepared participants may be turned away. Your work here will have direct impact on our local land and wildlife! This season, we will be planting and weeding. 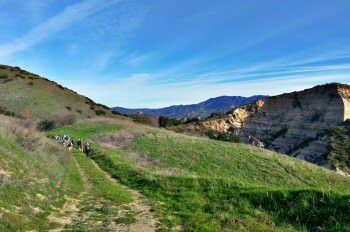 Later on, the seed will be harvested and used out in the wild to re-grow animal habitat within the Irvine Ranch Natural Landmarks. Our ecologists hand-select the types of plants we use, tailoring our choices to provide animals with food and shelter as well as mitigating the negative impacts of floods and wildfires- all of which affect people too! Come help us harness the special traits of these plants to heal the wildlands within the Landmarks.